You have a group of new volunteers starting at your organization. They have “aspirations to change the world.” And since you only have one chance to make a good first impression, how will you welcome them into your community? 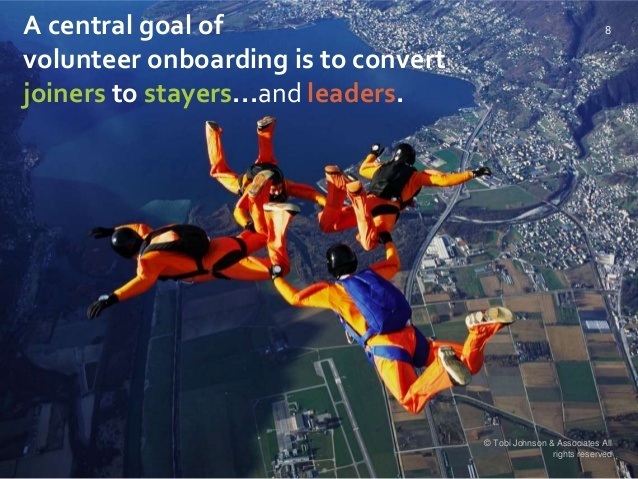 Do you have a volunteer onboarding process? 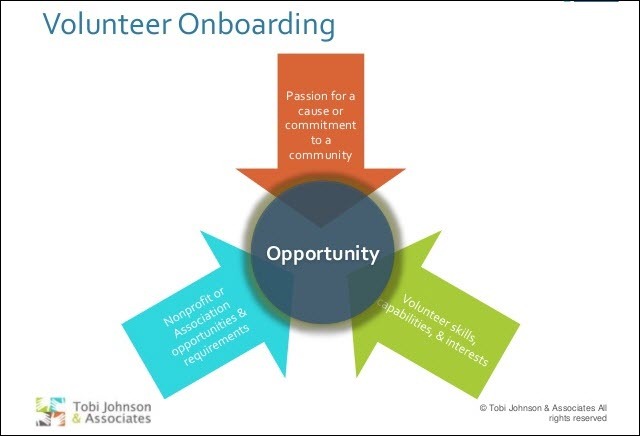 As part of our National Volunteer Week celebrations, Wild Apricot hosted an Expert Webinar on volunteer onboarding, presented by Tobi Johnson (Tobi Johnson & Associates), a recognized expert in the field of volunteer engagement. Here are highlights from the webinar presentation and 4 reasons why you should have a volunteer onboarding process in place. Your volunteers come to your organization with a “passion for your cause or a commitment to your community”. They also have specific expectations, which are often very lofty and possibly even unrealistic. At the same time, volunteers each bring skills, capabilities and interests to the table. The onboarding process is where you balance volunteer expectations with organizational goals and program expectations to create a positive experience for your volunteers. This process builds a foundation of mutual trust and “deepens their involvement”. If, on the other hand, your volunteers don’t feel they are being heard or their expectations are being met, they likely won’t continue in their volunteer roles. Purpose: Pursuing a higher purpose. Related goals, beyond their own self interest. As Tobi reminded us, we all want to feel we belong and fit in. So you should try to help volunteers acclimate to your organization or community. This involves understanding that they will experience a lot of conflicting emotions: surprise, anticipation, joy, fear, ambiguity. You also need to recognize that they will be looking for “social clues” and support. To help us understand some of the emotions volunteers experience and how to help them deal with these, Tobi introduced the SCARF neuroleadership model. This looks at human emotions including: Status, Certainty, Autonomy, Relatedness and Fairness – and their effects on teams in particular. She offered examples of ways to support these emotions with your volunteers, such as: to help reassure volunteers (certainty) you might offer a well defined schedule or calendar for the team; provide a handbook; and have regular scheduled meetings or training. While we are reluctant to talk about fear, acknowledge that some people will feel very unsure of themselves and may need support from staff or other volunteers. Rituals: establish safety – e.g., explain processes, e.g., "we always run the meeting this way..."
You can watch the full webinar video (including a special Overtime Q&A session) or check out the slide presentation and other resources here. To help you understand the onboarding volunteer journey, Tobi offered a “Volunteer Onboarding Journey Worksheet” – available here – along with other resources, such as a Volunteer ROI Calculator. Commitment is a Process, More than a Destination – Even after volunteers have been recruited, they are still checking out your organization and the people who work and volunteer there. We often think onboarding is all about paperwork, orientation, and training. In reality, volunteers are still making a decision about whether or not they will stay. Good luck with your volunteer onboarding! As Tobi demonstrated in this Expert Webinar, with effective onboarding, you can “inspire deeper participation and commitment” among your amazing team of volunteers.